Emergents These giant trees are much higher than the average canopy tree. 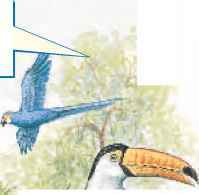 Birds, such as the macaw, and insects are found here. Canopy The canopy includes the upper parts of the trees. It's full of life—insects, birds, reptiles, and mammals. 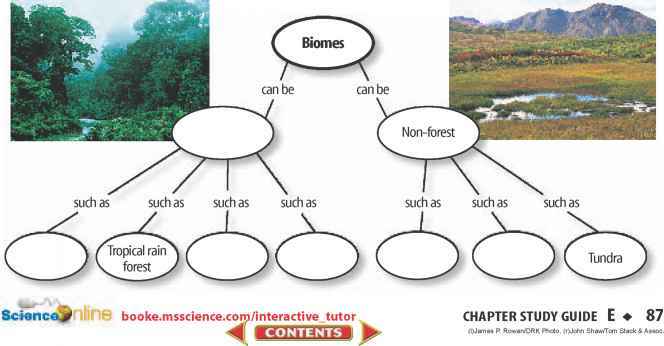 Figure 12 Tropical rain forests contain abundant and diverse organisms. Understory This dark, cool environment is under the canopy leaves but above the ground. Many insects, reptiles, and amphibians live in the understory. Forest Floor The forest floor is .y home to many insects and the largest mammals in the rain forest generally live here. Desertification When vegetation is removed from soil in areas that receive little rain, the dry, unprotected surface can be blown away. If the soil remains bare, a desert might form. This process is called desertification. Look on a biome map and hypothesize about which areas of the United States are most likely to become deserts. Figure 13 Desert plants, like these in the Sonoran Desert, are adapted for survival in the extreme conditions of the desert biome. The giant hairy scorpion found in some deserts has a venomous sting. Desert The driest biome on Earth is the desert. Deserts receive less than 25 cm of rain each year and support little plant life. Some desert areas receive no rain for years. When rain does come, it quickly drains away. Any water that remains on the ground evaporates rapidly. Most deserts, like the one in Figure 13, are covered with a thin, sandy, or gravelly soil that contains little organic matter. Due to the lack of water, desert plants are spaced far apart and much of the ground is bare. Barren, windblown sand dunes are characteristics of the driest deserts. I i^iJ^IiJIIlTtiiT^L^ Why is much of a desert bare ground? Desert Life Desert plants are adapted for survival in the extreme dryness and hot and cold temperatures of this biome. Most desert plants are able to store water. Cactus plants are probably the most familiar desert plants of the western hemisphere. Desert animals also have adaptations that help them survive the extreme conditions. Some, like the kangaroo rat, never need to drink water. They get all the moisture they need from the breakdown of food during digestion. Most animals are active only during the night, late afternoon, or early morning when temperatures are less extreme. Few large animals are found in the desert. In order to provide water for desert cities, rivers and streams have been diverted. When this happens, wildlife tends to move closer to cities in their search for food and water. Education about desert environments has led to an awareness of the impact of human activities. As a result, large areas of desert have been set aside as national parks and wilderness areas to protect desert habitats. (l)Joe McDonald/DRK Photo, (r)Steve Solum/Bruce Coleman, Inc.
Grasslands Temperate and tropical regions that receive between 25 cm and 75 cm of precipitation each year and are dominated by climax communities of grasses are called grasslands. Most grasslands have a dry season, when little or no rain falls. This lack of moisture prevents the development of forests. Grasslands are found in many places around the world, and they have a variety of names. The prairies and plains of North America, the steppes of Asia, the savannas of Africa shown in Figure 14, and the pampas of South America are types of grasslands. 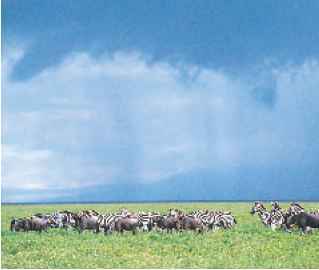 Figure 14 Animals such as zebras and wildebeests are adapted to life on the savannas in Africa. Grasslands Life The most noticeable animals in grassland biomes are usually mammals that graze on the stems, leaves, and seeds of grass plants. Kangaroos graze in the grasslands of Australia. In Africa, communities of animals such as wildebeests, impalas, and zebras thrive in the savannas. Grasslands are perfect for growing many crops such as wheat, rye, oats, barley, and corn. Grasslands also are used to raise cattle and sheep. However, overgrazing can result in the death of grasses and the loss of valuable topsoil from erosion. Most farmers and ranchers take precautions to prevent the loss of valuable habitats and soil. Tundra, sometimes called a cold desert, can be divided into two types: arctic and alpine. Taiga is the world's largest biome. It is a cold forest region with long winters. 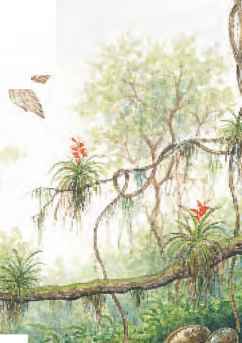 Temperate regions have either a deciduous forest biome or a rain forest biome. Tropical rain forests are one of the most biologically diverse biomes. Humans have a huge impact on tropical rain forests. The driest biome is the desert. Desert organisms are adapted for extreme dryness and temperatures. Grasslands provide food for wildlife, livestock, and humans. 1. Determine which two biomes are the driest. 2. Compare and contrast tundra organisms and desert organisms. 3. Identify the biggest climatic difference between a temperate rain forest and a tropical rain forest. 4. Explain why the soil of tropical rain forests make poor farmland. 5. Think Critically If you climb a mountain in Arizona, you might reach an area where the trees resemble the taiga trees in northern Canada. Why would a taiga forest exist in Arizona? 6. Record Observations Animals have adaptations that help them survive in their environments. Make a list of animals that live in your area, and record the physical or behavioral adaptations that help them survive.